Swiftline Global Logistics Pvt Ltd – We Deliver Trust. Your reliable partner for worldwide shipments. Across the seven seas no matter what size your cargo is. We are specialized in providing Liner Agency services to our clients at highly affordable prices. These services offered by us are extensively used in various leading MLOs at various ports and inland locations. In addition to this, we also offer in-house customs house agency that helps us in covering 45% of cargo control on East Coast of India Particularly on Reefer cargo. Represents world class shipping lines in various locations across the country. Presently, AVION SHIPPING ENTERPRISES is registered as Vessel Agents with Mumbai port, soon to be extended into other Major Ports in India. Seaways Group provides liner agency services to various leading MLOs and shipping lines since inception at various ports and inland locations in India. Seaways commands about 45% market share in liner agency services (along with in-house Customs House Agency) on the Indian East Coast. With our wide network of offices, well-trained staff and extensive contacts with shippers, we are exclusive agents for many container liners and feeder operators. As a NVOCC operator, the group is now focussing on the Gulf and Far East markets. To serve our clients requirements, IAL has strategically-placed agency offices across the Indian Sub-continent, Middle East and South East Asia, supporting our liner shipping activities. Believing in values-driven business growth, Trans Asia Line (TAL) has established itself in various regions across the world, to meet the global customers’ demands. The group companies were agents of M/s. Norasia Line in India from 1993 – 2005. In 2003 the group established liner operations under the brand Trans Asia Line. A core area of IAL’s business, Liner Shipping is the transportation of goods by sea, along regular transit routes with fixed sailing schedules and ports of call. RCCL Group has a proven track record in operation of Liner Services. Both kinds of liner services are offered by us, whether they are container liner service (FCL) or break bulk liner services (LCL). We are among the market leaders in these services so next time you need full container load liner service or less than container load liner service, think of us. Albatross Shipping is one of the leading agency networks in Asia and offers a seamless and consistent service through all its countries of operation. By understanding the demands of our clients in the best possible way, we are readily immersed in presenting Liner Shipping Services. These services are imparted after comprehending the varying needs of our patrons as per the desires specified by our clients. Not only this, these services could be acquired from us at highly affordable costs amid the assured period of time. Seaways Group provides liner agency services to various leading MLOs and shipping lines since inception at various ports and inland locations in India. Seaways commands substantial market share in liner agency services (along with in-house Customs House Agency) on the Indian East Coast. 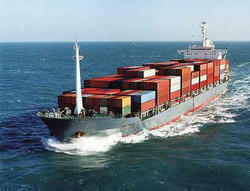 - Represents world class shipping lines in various locations across the country.